A couple of years ago, Northwestern unveiled a brand campaign for its football program that touted it as “Chicago’s Big Ten Team.” Whether or not Northwestern has truly claimed that title is debatable – especially as area bars proudly fly flags from Illinois, Michigan, Nebraska, Iowa, Michigan State and more – but what isn’t as much in question is evidence that the program is on the verge of transforming its gridiron brand into a much higher state of awareness with some strong offline and online milestones. To be competitive in The Big 10 Conference for recruits, it’s imperative that the program have a state-of-the-art practice facility. And from the way it’s been described by University President Morton Schapiro, it’s clear now Northwestern intends to have one. This past weekend, the University announced its Board of Trustees had approved a plan to build a new $220 million sports complex on the north end of campus which will feature a practice facility that seats 2,500, a swimming pool, an outdoor practice field, locker rooms, weight rooms, sports medicine facilities and a parking structure with 1,200 spaces. While the lakefront complex will benefit a variety of sports across the university, there’s little doubt what sport it appears designed for most. In drawing 31,644 against Vanderbilt, Northwestern boasted its largest opening crowd at Ryan Field for an opening home game since 2001. Sure, those numbers may not seem like much compared to other Big 10 Conference giants like Michigan or Ohio State, but it’s little coincidence in my mind that the average home attendance increased significantly around the same time that Northwestern rolled out its first marketing campaign in 2010. So while there’s work to do to live up to the “Chicago’s Big Ten Team” message, the results of the campaign are encouraging so far. 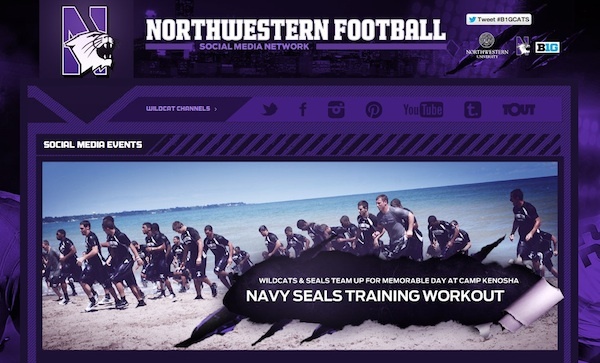 Just two weeks ago, the football program launched the Northwestern Football Social Media Network, which brings together a multitude of platforms in one page: YouTube clips, Facebook updates, Twitter feeds, images from Instagram and Pinterest and more. More than an aggregator that mashes content together, however, the site from interactive studio Uncommon Thinking cleanly connects fans to their favorite channels for ongoing browsing and content sharing. By the way, there’s one channel on the site that you probably won’t immediately recognize but should keep your eye on. It’s called Tout, a networking outlet that allows you to create 15-second status updates on your smartphone you can share in real-time and automatically on your social media networks. The real brand message? Value. In an economic time where fan dollars become even more precious, the brand positioning of Northwestern shouldn’t necessarily be “Chicago’s Big Ten Team” but to hammer home a reality they have consistently lived up to – win or lose, their down-to-the-wire games are hardly ever boring. It is an electrifying college football experience, whether you went to school to Evanston or happen to be rooting for the visiting team from, say, Ann Arbor or East Lansing. And because of that experience week in and week out, the “Cardiac Cats” provide a product that is absolutely an excellent value. In fact, it might be the best sports value in town for the money. That’s right. You heard me. Consider what it costs a family of four to attend a sporting event that includes parking, concessions and tickets. Now calculate that over six home games. How easily can your family swing that? While that’s unthinkable for many of us to afford, it becomes more palatable when tickets can be had in the $20-30 range, parking nearby is free and you don’t have to pay a fortune for beer, which keeps the overall cost low and the overall atmosphere more, well, family-friendly. With a team that believes it can play in a BCS bowl – and it’s not as far-fetched as it sounds – investments in new marketing campaigns, practice facilities and long-term coaching contracts aren’t just refreshing but reflecting a new era of greater expectations that truly began when Gary Barnett took the team to the Rose Bowl in 1995. Going to bowl games are the new norm. Winning them with consistency must come next. And once that new ground is reached? Better bowls. Bigger recruiting results. Hopefully greater enhancements to Ryan Field, complete with luxury boxes. Let’s just say things could get really interesting in Evanston.